The following goes with this post – Scientology’s Elusive Jerry McDonald – Drugs, Guns, and The Brotherhood. 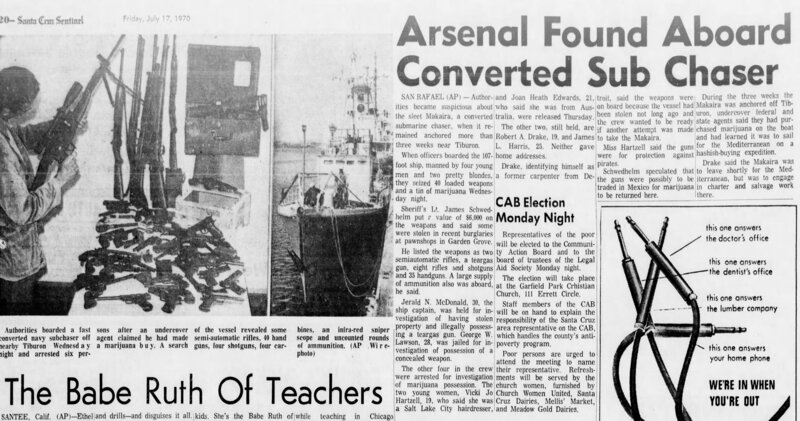 In that article I had included images of news articles concerning Jerry getting busted for running drugs and guns on his ship the Makaira (while being a Sea Organization member of the Church of Scientology). *Also see post about scientology Guardian’s Office Terry Milner and documents found about him in the recently declassified FDA documents – he worked directly with Jerry. To make the text more accessible to researchers, I have typed out each one. Here is the overall list of articles (with a few additions that I found later)followed by a each article with it’s images and text. Albuquerque Journal December 20, 1970, Sunday. 14. 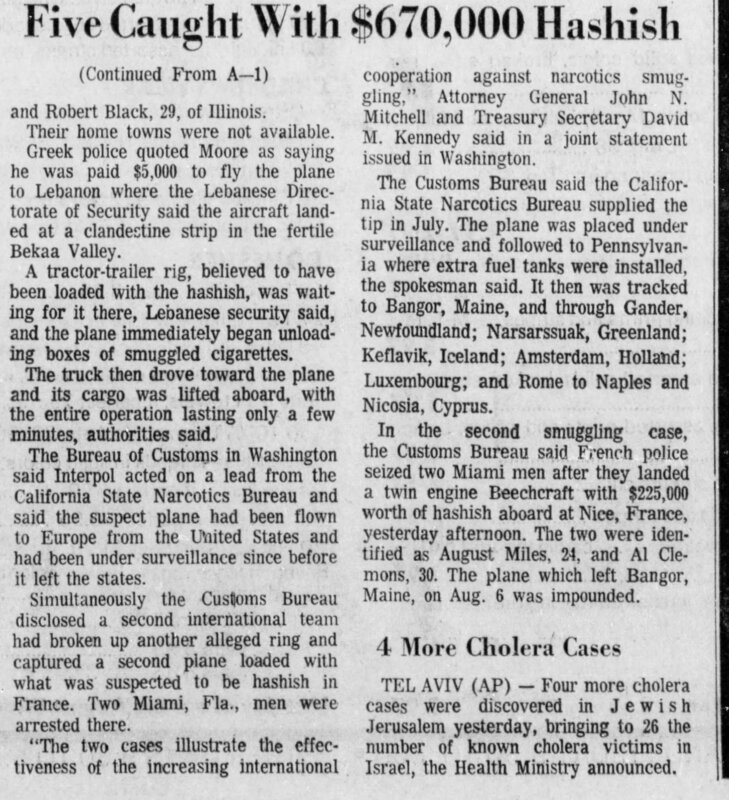 The San Bernardino County Sun, Sunday August 30, 1970, 2 parts, titled: 5 Caught with $670,000 Hashish Load. Drug agents looking for marijuana boarded a 107-foot converted subchaser anchored off Tiburon last night and found an arsenal of weapons, arresting six young persons aboard. Lt. James C. Schwedhelm of the Marin Drug Abuse Bureau said narcotics agents suspected the boat was being used to haul marijuana when it appeared first in Sausalito about three weeks ago. It later was moved to the mouth of Tiburon Harbor. “A bunch of kids on a subchaser” seemed odd to the officers, Schwedhelm said, and undercover agents who soon made friends with the boat’s occupants arranged for a sale of marijuana. 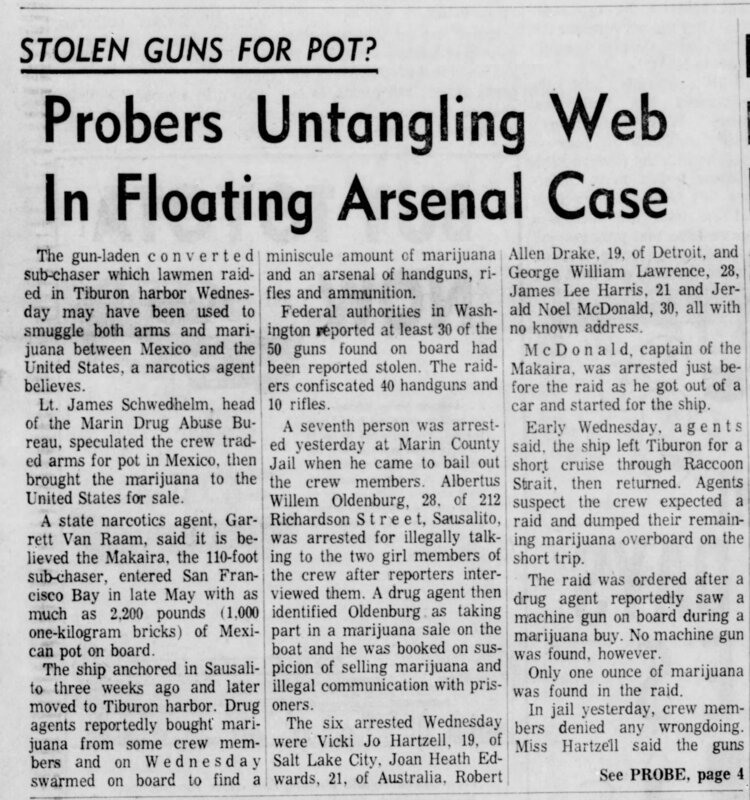 An agent who went aboard the board [sic: boat], named the Makaira, thought he saw a machine gun aboard and a search warrant was obtained to look for illegal weapons. 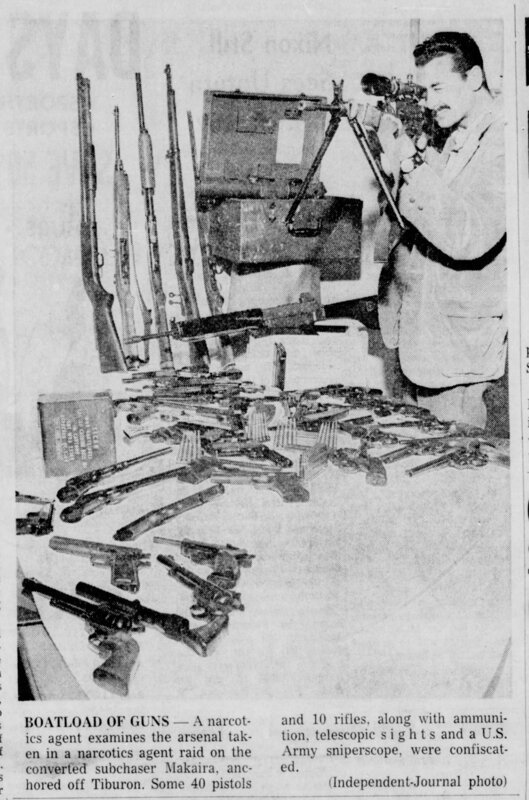 Although the agents found only a small quantity of marijuana, they said “there were guns everywhere.” Handguns in holsters hung from all the bunks of the ship, Schwedhelm said, and the agents rounded up about 40 revolvers and pistols and about 10 rifles, many of them loaded. A large quantity of ammunition was also found. The agents believed the guns had been taken in trade for marijuana, which the agents think the boat’s occupants were importing from Mexico. The suspected machine gun turned out to be a rifle resembling one, he said. Also seized was an army sniper scope. All guns will be checked to determine if they are stolen, Schwedhelm said. One man arrested in a car ashore had two loaded guns under the seat, Schwedhelm said. He was identified as Jerald Noel McDonald, 30, of no known address. 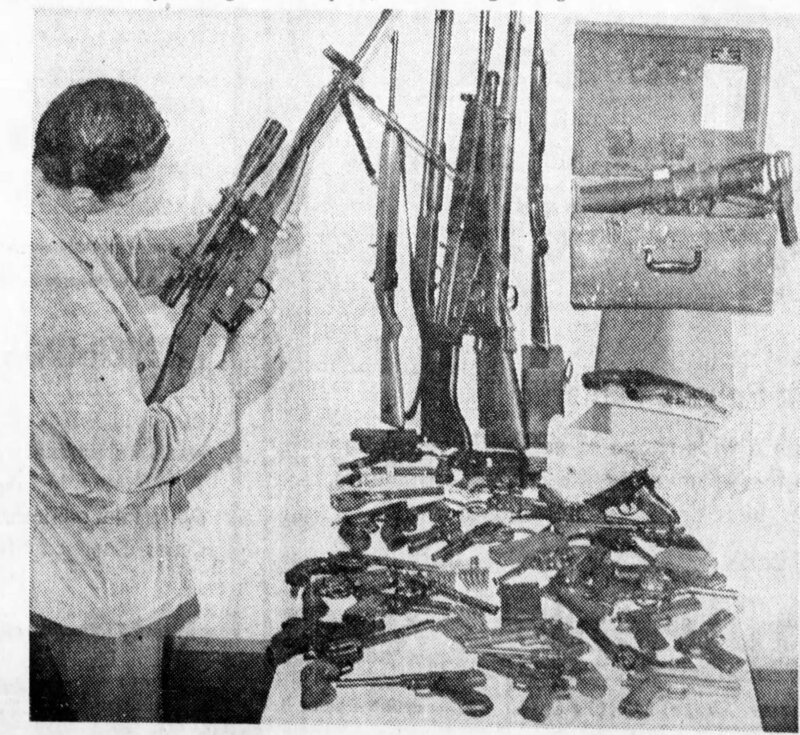 BOATLOAD OF GUNS – A narcotics agent examines the arsenal taken in a narcotics agent raid on the converted subchaser Makaira, anchored off Tiburon. Some 40 pistols and 10 rifles, along with ammunition, telescopic sights and a U.S. Army sniperscope, were confiscated. 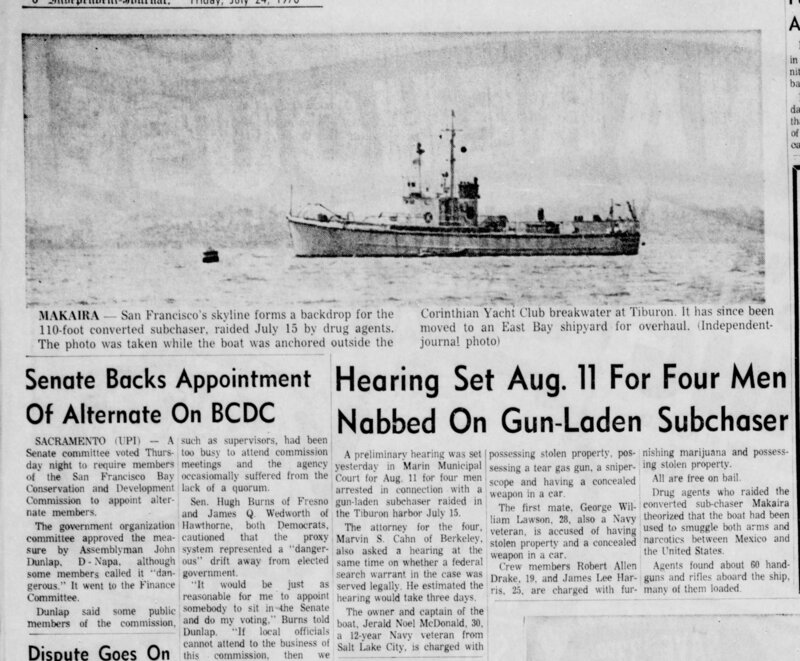 Authorities became suspicious about the yacht Makaira, a converted submarine chaser, when it remained anchored more than three weeks near Tiburon. When officers boarded the 107-foot ship, manned by four young men and two pretty blondes, they seized 40 loaded weapons and a tin of marijuana Wednesday night. Sheriff’s Lt. James Schwedhelm put a value of $6,000 on the weapons and said some were stolen in recent burglaries at pawnshops in Garden Grove. He listed the weapons as two semi-automatic rifles, a tear gas gun, eight rifles and shotguns and 35 handguns. A large supply of ammunition also was aboard, he said. Jerald N. McDonald, 30, the ship captain, was held for investigation of having stolen property and illegally possessing a tear gas gun. George W. Lawson, 28, was jailed for investigation of possession of a concealed weapon. The other four in the crew were arrested for investigation of marijuana possession. the two young women, Vicki Jo Hartzell, 19, who said she was a Salt Lake City hairdresser, and Joan Heath Edwards, 21, who said she was from Australia, were released yesterday. The other two, still held, are Robert A. Drake, 19, and James L. Harris, 25. Neither gave home addresses. Drake, identifying himself as a former carpenter from Detroit, said the weapons were on board because the vessel had been stolen not long ago and the crew wanted to be ready if another attempt was made to take the Makaira. During the three weeks the Makaira was anchored off Tiburon, undercover federal and state agents said they had purchased marijuana on the boat and had learned it was to sail for the Mediterranean on a hashish-buying expedition. Drake said the Makaira was to leace shortly for the Mediterranean, but was to engage in charter and salvage work there. Miss Hartzell said the guns were for protection against pirates. Schwedhelm speculated that the guns were possibly to be traded in Mexico for marijuana to be returned here. 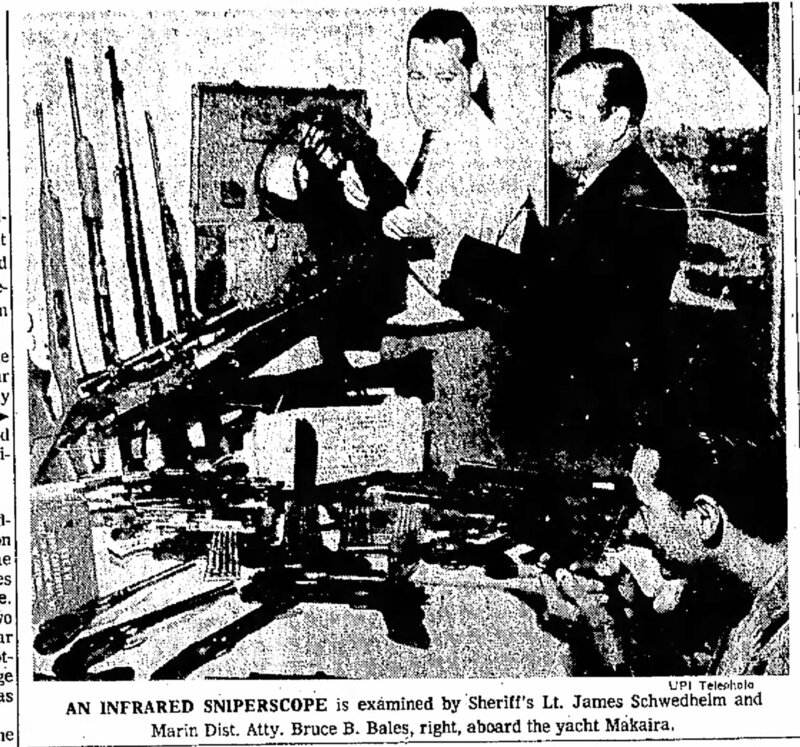 An infrared sniperscope is examined by Sheriff’s Lt. James Schwedhelm and Marin District Attorney Bruce B. Bales, right, aboard the Yacht Makaira. Investigators checked yesterday on the possibility a converted Navy subchaser on which four young men and two pretty blondes were arrested might have been used in an illegal trade of narcotics and guns. Eight federal, state and Marin County officers boarded the sleek 107-foot ship Wednesday night in San Francisco Bay off Tiburon, seizing an arsenal of wepons, a large stock of ammunition, and small quanitites of marijuana. Sheriff’s Lt. James Schwedhelm, head of Marin County’s drug abuse squad, said the weapons were worth about $6,000 and serial numbers on most of the guns matched those on guns stolen at Garden Grove recently. Schwedhelm said he would investigate if the weapons were to be traded in Mexico for marijuana to be returned here. He said 35 handguns, eight rifles and shotguns, a teargas gun and two AR17 semiautomatic rifles were seized. Most were loaded. One of the men aboard said the vessel was stolen not long ago and the weapons were for guarding it. The Coast Guard took the ship, the Makaira, to Governmet Island. Schwedhelm said the craft, capable of 33-knot-an-hour speed, had been purchased by Jerald Noel McDonald, 30, with a $10,000 down payment, $9,000 more was being monthly over three years. McDonald and the other five arrested said they lived aboard the boat and had no fixed addresses. The others are Robert Allen Drake, 19; James Lee Harris, 25; George William Lawson, 28; Joan Heath Edwards, 21; and Vicki Jo Hartzell, 19. Authorities became suspicious about the sleet Makaira, a converted submarine chaser, when it remained anchored more than three weeks near Tiburon. Sheriff’s Lt. James Schwedhelm put a value of $6,000 on the weapons and said some were stolen in recent burglaries at pawnshops in Garden Grove. He listed the weapons as two semiautomatic rifles, a teargas gun, eight rifles and shotguns and 35 handguns. A large supply of ammunition also was aboard, he said. Jerald N. McDonald, 30, the ship captain, was held for investigation of having stolen property and illegally possessing a teargas gun. George W. Lawson, 28, was jailed for investigation of possession of a concealed weapon. The other four in the crew were arrested for investigation of marijuana possession. The two young women, Vicki Jo Hartzell, 19, who said she was a Salt Lake City hairdresser, and Joan Heath Edwards, 21, who said she was from Australia, were released Thursday. Drake, Identifying himself as a former carpenter from Setroit, said the weapons were on board because the vessel had been stolen not long ago and the crew wanted to be ready if another attempt was made to take the Makaira. During the three weeks the Makaira was anchored off Tiburon, undercover federal and stage agents said they had purchased marijuana on the boat and had learned it was in sail for the Mediterranean on a hashish-buying expedition. Drake said the Makaira was to leave shortly for the Mediterranean, but was to engage in charter and salvage work there. The gun-laden converted sub-chaser which lawmen raided in Tiburon harbor Wednesday may have been used to smuggle both arms and marijuana between Mexico and the United States, a narcotics agent believes. 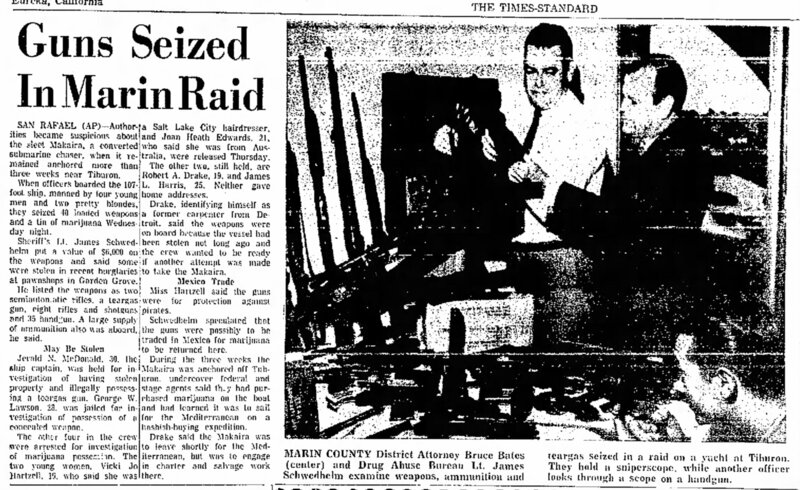 Lt. James Schwedhelm, head of the Marin Drug Abuse Bureau, speculated the crew traded arms for pot in Mexico, then brought the marijuana to the United States for sale. A state narcotics agent, Garrent Van Raam, said it is believed the Makaira, the 110-foot sub-chaser, entered San Francisco Bay in late May with as much as 2,200 pounds (1,000 one-kilogram bricks) of Mexican pot on board. The ship anchored in Sausalito three weeks ago and later moved to Tiburon harbor. Durg agents reportedly bought marijuana from some crew members and on Wednesday swarmed on board to find a miniscule amount of marijuana and an arsenal of handguns, rifles and ammunition. Federal authorities in Washington reported at least 30 of the 50 guns found on board had been reported stolen. The raiders confiscated 40 handguns and 10 rifles. A seventh person was arrested yesterday at Marin County Jail when he came to bail out the crew members. Albertus Willem Oldenburg, 28, of 212 Richardson Street, Sausalito, was arrested for illegally talking to the two girl members of the crew after reporters interviewed them. A drug agent then identified Oldenburg as taking part in a marijuana sale on the boat and he was booked on suspicion of selling marijuana and illegal communication with prisoners. Jerald Noel Mcdonald, 30, all with no known address. McDonald, captain of the Makaira, was arrested just before the raid as he got out of a car and started for the ship. Early Wednesday, agents said, the ship left Tiburon for a short cruise through Raccoon Strait, then returned. Agents suspect the crew expected a raid and dumped their remaining marijuana overboard on the short trip. The raid was ordered after a drug agent, reportedly saw a machine gun on board during a marijuana buy. No machine gun was found, however. Only one ounce of marijuana was found in the raid. In jail yesterday, crew members denied any wrongdoing. Miss Hartzell said the guns were to protect the ship from piracy. An attempt had been made to steal the ship several months ago, she said. All seven defendants were to appear today in Marin Municipal Court. Drake, Harris and Oldenburg were held on suspicion of selling marijuana. Miss Edwards on suspicion of offering to sell marijuana, Miss Hartzell and Lawson on suspicion of possessing marijuana, and McDonald on suspicion of having marijuana and a tear gas gun when arrested. The district attorney’s office was reviewing the case this morning to see if gun charges or other charges would be filed today. A preliminary hearing was set yesterday in Marin Municipal Court for Aug. 11 for four men arrested in connection with a gun-laden subchaser raided in the Tiburon harbor July 15. The attorney for the four, Marvin S. Cahn of Berkeley, also asked a hearing at the same time on whether a federal search warrant in the case was served legally. He estimated the hearing would take three days. The owner and captain of the boat, Jerald Noel McDonald, 30, a 12-year Navy veteran from Salt Lake City, is charged with possessing stolen property, possessing a tear gas gun, a sniper-scope and having a concealed weapon in a car. The first mate, George William Lawson, 28, also a Navy veteran, is accused of having stolen property and a concealed weapon in car. Crew members Robert Allen Drake, 19, and James Lee Harris, 25, are charged with furnishing marijuana and possessing stolen property. 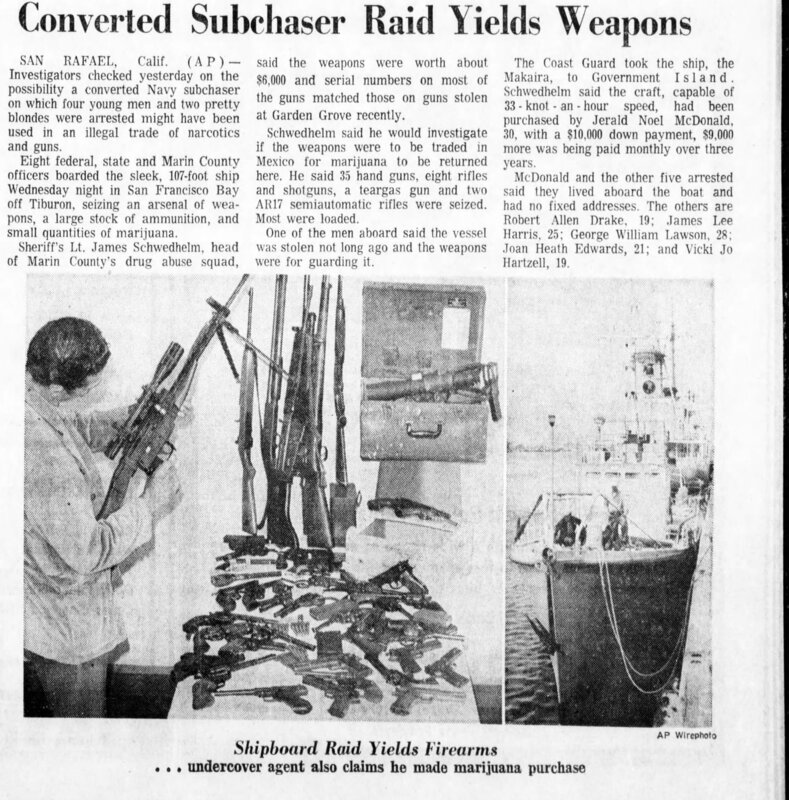 Drug agents who raided the converted sub-chaser Makaira theorized that the boat had been used to smuggle both arms and narcotics between Mexico and the United States. Agents found about 60 guns and rifles aboard the ship, many of them loaded. San Francisco’s skyline forms a backdrop for the 110-foot converted subchaser, raided July 15 by drug agents. The photo was taken while the boat was anchored outside the Corinthian Yacht Club breakwater at Tiburon. It has since been moved to an East Bay shipyard for overhaul. During the three weeks the Makaira was anchored off Tiburon, undercover federal and state agents said they had purchased marijuana on the board and had learned it was to sail for the Mediterranean on a hashish-buying expedition. Authorities boarded a fast converted navy subchaser off nearby Tiburon Wednesday night and arrested six persons after an undercover agent claimed he had made a marijuana buy. A search of the vessel revealed some semi-automatic rifles, 40 hand guns, four shotguns, four carbines, an infra-red sniper scope and uncounted rounds of ammunition. #8 – Daily Independent Journal (San Rafael, California) November 7, 1970, Saturday, p. 28, Title: Captain of Gun-Laden Subchaser Disappears. The captain of a gun-laden subchaser raided in the Tiburon Harbor on July 15 has disappeared although his attorney said yesterday he thinks the boat is still in the Bay Area. After attorney Marvin Cahn of Berkeley reported in Marin Municipal Court yesterday that he cannot locate Jerald Noel McDonald, 30-year-old Salt Lake City Navy veteran, nor his boat, a bench warrant was issued for McDonald. Judge Alvin H. Goldstein Jr. set bail on the bench warrant at $5,000 and ordered McDonald’s earlier bail forfeited. Earlier the court had issued a bench warrant for the first mate of ship Makaira, George William Lawson, 28, also a Navy veteran. McDonald is charged with possessing stolen property, possessing a tear gas gun, a sniper-scope and having a concealed weapon in a car. A preliminary hearing for the remaining crew members, Robert Allen Drake, 19, and James Lee Harris, 25, is set for next Tuesday. They are accused of furnishing marijuana and possessing stolen property. Drug agents who raided the converted subchaser theorized that the boat had been used to smuggle both arms and narcotics between Mexico and the United States. The agents found no narcotics on the day of the arrest, but confiscated about 60 handguns and rifles, many of them loaded. The captain of a converted subchaser raided in the Tiburon harbor last July sailed out of a Marin Municipal courtroom yesterday cleared of all criminal charges. Judge Peter Allen Smith freed Jerald Noel McDonald, 30-year-old Navy veteran from Salt Lake City, saying the district attorney’s office had not presented enough evidence at a preliminary hearing to hold him for trial on stolen property and weapons charges. Also cleared was the first mate of the Makaira, George William Lawson, 28, another Navy veteran who has been missing since the early stage of the case. Deputy District Attorney J Michael Anthony said after the court decision that he had been been unable to link the 60 guns found aboard the ship to any individual nor had he been able to find evidence that McDonald and his crew knew that many of the weapons were stolen. Anthony said the majority of the handguns seized on the ship had been stolen in the burglary of a Garden Grove pawnshop last April and that they would be returned to the owner. In another development yesterday two of the crew members, Robert Allen Drake, 19, and James Lee Harris, 25, moved through their attorney, Robert McDonald, to withdraw their earlier pleas of guilty to the pot charges. The youths had pleaded guilty to misdemeanor counts in exchange for dismissal of felony counts of furnishing marijuana to a drug agent, the incident which led to the raid of the ship. Their case was continued to Dec. 23. Drug agents have theorized that the subchaser, a very fast ship, was being used to smuggle both arms and drugs between Mexico and the United States but no drugs were found during the raid. The captain of a converted subchaser raided in the Tiburon Harbor last July was ushered last night into the presence of the Marin County Grand Jury, which shortly thereafter emerged from behind closed door to indict Sausalito attorney Michael Henry Metzger. Gerald N. McDonald, 30-year-old Navy veteran from Salt Lake City who himself was freed of criminal charges last week, was the only nonofficial to appear in the case before the grand jury. Metzger, a former federal prosecutor in San Francisco was charged with four felonies and one misdemeanor stemming from the raid on his home Dec. 6. According to a search warrant which drug agents obtained before going to Metzger’s luxurious three-story house, they had been told by an informant that he had seen the attorney use marijuana and offer it and other drugs to guests on three occasions. The affidavit attached to the search warrant said that the same informant had led to arrests of persons involved with a bargeload of marijuana in Southern California and to a big cocaine haul in San Francisco. McDonald himself was arrested after the barge bust, when his boat, the Makaira was raided. 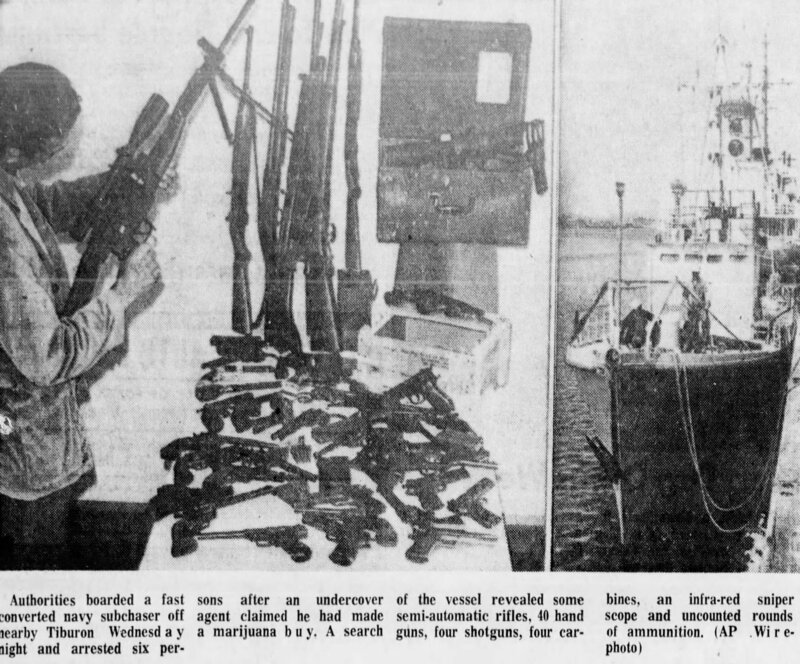 Drug agents looking for pot on the ship fund none, but confiscated about 60 guns, any of which turned out to be stolen. Charges against McDonald were dismissed last week after a preliminary hearing in municipal court when Judge Peter Allen Smith said that no evidence had been presented to show McDonald knew the guns were stolen. McDonald were dismissed and had no connection with his presumably having cooperated with narcotics agents. Agents and police who went to Metzger’s home said they found a safe partially hidden in a closet which contained LSD, cocaine, marijuana, hashish and $5,440 in cash. The indictment of Metzger yesterday eliminates a preliminary hearing in municipal court which had been scheduled for Dec. 18. The attorney, who once worked as an assistant district attorney in New York, will be arraigned in superior court Monday. Judge Joseph G. Wilson yesterday ordered that the transcript of testimony before the grand jury be sealed until 10 days after Metzger appears in court with his attorney. Since his initial appearance in municipal court. Metzger has hired San Rafael attorney William O. Weissich to represent him, replacing Patrick Hallinan. Metzger has claimed that the drug raid was made by state narcotics agents in retaliation for his demand that an agent be made to take a lie detector test in a San Mateo County case. A former assistant U.S. attorney has revealed a strange scheme that he claims featured use of a submarine chaser to rescue five northern Californians held in Crete on smuggling charges. Attorneys for Michael Metzger, who represents some of the Americans held in Crete, said Wednesday the scheme involves a July raid in Tiburon in which federal and state agents boarded the Makaira, a 107-foot converted sub-chaser, in a narcotics search. The agents found one lid of marijuana and discovered an arsenal of guns, including two semi-automatic weapons, two carbines, four shotguns and 35 hand guns. The five Americans are being held for hashish smuggling. They were forced to land in Crete after their airplane developed engine trouble. Authorities said they found 1,400 pounds of hashish worth more than $500,000 in the plane. 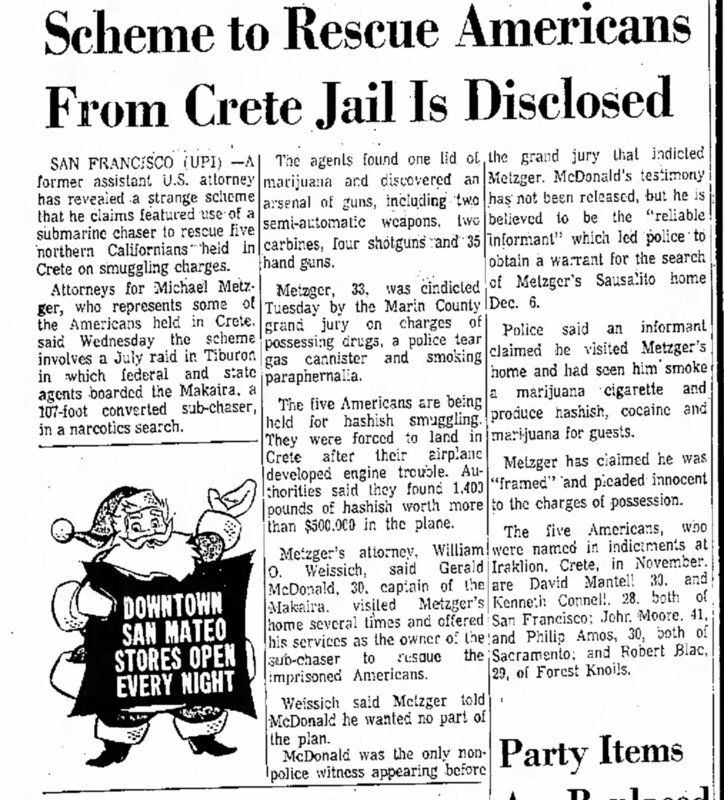 Metzger’s attorney, William O. Weissich, said Gerald McDonald, 30, captain of the Makaira, visited Metzger’s home several times and offered his services as the owner of the sub-chaser to rescue the imprisoned Americans. Weissich said Metzger told McDonald he wanted no part of the plan. McDonald was the only non-police witness appearing before the grand jury that indicted Metzger. McDonald’s testimony has not been released, but he is believed to be the “reliable informant” which led police to obtain a warrant for the search of Metzger’s Sausalito home Dec. 6. Police said an informant claimed he visited Metzger’s home and had seen him smoke a marijuana cigarette and produce hashish, cocaine and marijuana for guests. Metzger has claimed he was “framed” and pleaded innocent to the charges of possession. The five Americans, who were named in indictments at Iraklion, Crete, in November, are David Mantell 30, and Kenneth Connell, 28, both of San Francisco; John Moore, 41, and Philip Amos, 30, both of Sacramento; and Robert Blac, 29, of Forest Knolls. Iraklion, Crete – Five Californians accused of being members of an international narcotics smuggling ring were convicted early Saturday of possessing 1425 punds of hashish. The five were seized last August at Iraklion when their private plane landed for refueling after being pursued across the Mediterranean by Lebanese British and Greek air force jet fighters. Police said they found 13 sacks of hashish hidden on board the plane. The defendants were sentenced by the three-judge court to prison terms ranging from 9 to 10 years and were fined from $5000 to $10,000. Defense attorneys said they will appeal the lengths of the sentences but not the guilty verdicts. The pilot of the plane, John R. Moore, 50, a retired U.S. Air Force Lieutenant Colonel, Philip Irwin Amos, 20, and Kenneth Connell, 28, all of Sacramento, and Robert Black, 29, of Forest Knolls, received 10 year sentences. David Lee Mantell, 30, of San Francisco, was given a nine-year sentence. EARLY one morning at the Nicosia airport on Cyprus, an American pilot filed a routine flight plan that would take his privately owned, unmarked Martin 202 directly to either Naples or Athens. Alerted by Interpol, the Nicosia air controllers were suspicious. Trailing the plane on radar, they watched it head toward Lebanon. The plane flew so low that it eluded Beirut radar, but Lebanese police started an immediate countrywide search. Within minutes, a police patrol found the Martin 202 parked alongside a large truck on a remote airstrip in the hashish-growing area of Baalbek, near the Syrian border. As police and truck guards fought a gun battle, the plane took off amid a hail of bullets. Lebanese jet fighters scrambled after the slow propeller-driven Martin, but it managed to escape them. Finally, after flying an erratic course over the Mediterranean, the plane was forced to make a landing to refuel at Heraklion airport in Crete. There, police at once arrested the five men aboard, including the pilot, former U.S. Air Force Lieut. Colonel John Moore, 50, and Copilot Philip Amos, 30. Crete police also seized 13 bags of hashish worth about $4,000,000 on the American market. According to John T. Cusack, chief U.S. narcotics agent in Europe, it was the largest single haul ever made of U.S. – bound hashish. American agents had been closely on the trail of this particular drug ring for several months. In a second coup, U.S. agents two weeks ago helped to break up the largest smuggling operation on record. Acting on American-supplied information, French and Swiss agents arrested two of the ring’s three members in Nice and Geneva. Since 1965 the smugglers had slipped an estimated $500 million a year in heroin into the U.S. by secreting the white powder in washrooms of U.S.-bound jets, in banana crates, in imported autos, and sometimes in sealed cans labeled as fish. Meanwhile, in Lyon, French police arrested two American smugglers and seized the small plane in which they intended to fly drugs to the U.S. 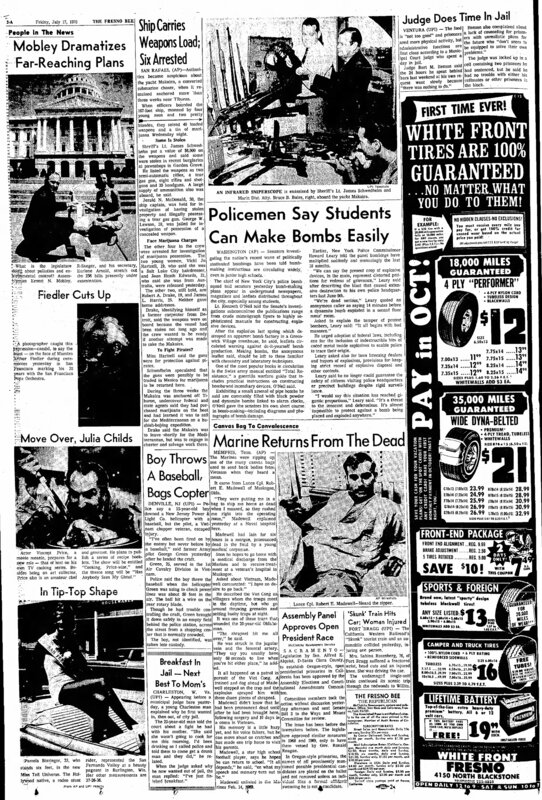 In Mexico, police gave President Gustavo Díaz Ordaz some good news to take to President Nixon. When the two men sat down to talk at Coronado, Calif., last week, Díaz Ordaz could tell the President that in recent days his agents had arrested 43 smugglers, confiscated 7.2 tons of marijuana and burned four large poppy fields. These recent successes are the result of the Nixon Administration’s diligent effort to enlist other countries in the American battle against drugs. Although tightened search procedures at U.S. airports and border crossings have managed to discourage some of the would-be smugglers, Washington hopes to choke off the flow at the source. Other governments, especially those in Europe, have become more cooperative since the use of hard drugs has begun spreading among their own young people. …In Turkey and elsewhere, however, U.S. efforts run squarely into the private-profit motive. For example, a Turkish farmer can receive as much as $94 if he sells the harvest of an acre of poppies to smugglers. By contrast, he stands to earn only $4.83 an acre if he grows wheat. Important Note: David Mantell is one of the top Brotherhood of Eternal Love members, and at this point in time he is working directly with Ronald Stark, CIA agent, while scientologists Terry Milner and Jerry McDonald are working with CIA agent Terrence Burke who paradoxically, is supposedly working to bust the Brotherhood. All of which is purely making a ‘good show’ for crook Richard Millhouse Nixon, then President of the U.S., who would then use these type of ‘busts’ to call for the formation of the DEA, which CIA agent Terrence would then be a top official of in just a couple years from this time..
#14 – The San Bernardino County Sun, Sunday August 30, 1970, 2 parts, titled: 5 Caught with $670,000 Hashish Load. An American twin-engine plane, carrying $670,000 worth of smuggled hashish, was seized on this Greek island yesterday after being chased across the Mediterranean by Lebanese and Greek jet fighters. Police said five Americans aboard the Corvair 240 were arrested. The plane and its cargo of 1,467 pounds of hashish were seized. Before the jets forced them to land at Iraklion airport, the men had swapped cigarettes for hashish at a secret Lebanese landing strip and made off through a hail of police gunfire, officials in Beirut reported. The official Lebanese statement also said two British planes were among the air armada that chased the aircraft from the Middle East. But the Royal Air Force in London denied it. John M. Cusack, chief of European operations for the U.S. Bureau of Narcotics and Dangerous Drugs – the BNDD – said in Paris that police forces and air traffic controllers throughout the eastern Mediterranean helped track the plane. With warplanes from various bases standing ready to intercept it, Cusack said, the plane flew erratically for a time and then was tracked over Cyprus and Rhodes. Running low on fuel and needing minor repairs, the aircraft finally landed at Iraklion where authorities had been forewarned that a suspicious plane was heading in their direction from the Middle East. A search disclosed the 13 bags of processed hashish, and police arrested all of the men on board. They were identified by Cusack in Paris as John Robert Moore, 41, Las Vegas, Nevada, the pilot; copilot Philip Irwin Amos, 30, and Kenneth Connell, 28, both of California; David Mantell, 30 of Ohio; and Robert Black, 29, of Illinois. Their home towns were not available. Greek police quoted Moore as saying he was paid $5,000 to fly the plane to Lebanon where the Lebanese Directorate of Security said the aircraft landed at a clandestine strip in the fertile Bekaa Valley. A tractor-trailer rig, believed to have been loaded with the hashish, was waiting for it there, Lebanese security said, and the plane immediately began unloading boxes of smuggled cigarettes. The truck then drove toward the plane and its cargo was lifted aboard, with the entire operation lasting only a few minutes, authorities said. The Bureau of Customs in Washington and Interpol acted on a lead from the California State Narcotics Bureau and said the suspect plane had been flown to Europe from the United States and had been under surveillance since before it left the states. Simultaneously the Customs Bureau disclosed a second international team had broken up another alleged ring and captured a second plane loaded with what was suspected to be hashish in France. Two Miami, Fla., men were arrested there. “The two cases illustrate the effectiveness of the increasing international cooperation against narcotics smuggling,” Attorney General John N. Mitchell and Treasury Secretary David M. Kennedy said in a joint statement issued in Washington. The customs Bureau said the California State Narcotics Bureau supplied the tip in July. The plane was placed under surveillance and followed to Pennsylvania where extra fuel tanks were installed, the spokesman said. It then was tracked to Bangor, Maine, and through Gander, Newfoundland; Narsarssuak, Greenland; Keflavik, Iceland; Amsterdam, Holland; Luxembourg; and Rome to Naples and Nicosia, Cyprus. In the second smuggling case, the Customs Bureau said French police seized two Miami men after they landed a twin engine Beechcraft with $225,000 worth of hashish aboard at Nice, France, yesterday afternoon. The two were identified as August Miles, 24, and Al Clemmons, 30. The plane which left Bangor, Main, on August 6, was impounded. 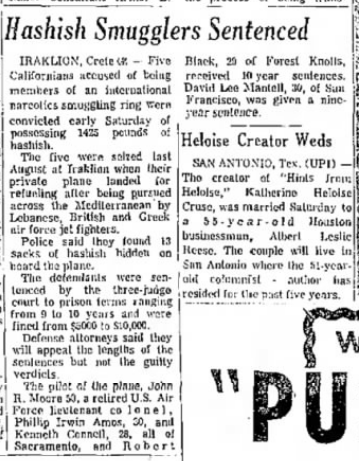 Iraklion, Crete – A retired U.S. Air Force pilot being tried on drug charges with four fellow Californians Friday night testified that he knew nothing about 1,400 pounds of hashish found on board his plane until he was arrested after landing in Crete. John B. Moore, 51, Sacramento, said he was hired in the United States to fly Arab political refugees out of Lebanon and Western Europe. Moore, a reserve Lieutenant colonel, said he was paid $5,000 in advance for the job by an unidentified person whom he met through two codefendants. The plane, which police said took off from a secret airport in Lebanon, landed last August at Iraklion Airport after being chased by Lebanese, British and Greek air force jets. Officials said the plane’s ultimate destination was the United States. The other four charged are Phillip Amos, 30, co-pilot, and Kenneth H. Connell, 23, both of Sacramento; David Mantell, 30, of San Francisco, and Robert Black, 29, of Forest Knolls. All five are charged with possession, purchase and transportation of what police described as a record load of hashish. Moore told the three-member court that the unidentified person was introduced to him by Connell and Black. He said Connell later told him that the purpose of the trip was to pick up high political Arab refugees from Lebanon and fly them secretly to Naples. The pilot said after they landed in Crete they were arrested and held at gunpoint until police searched the plane. 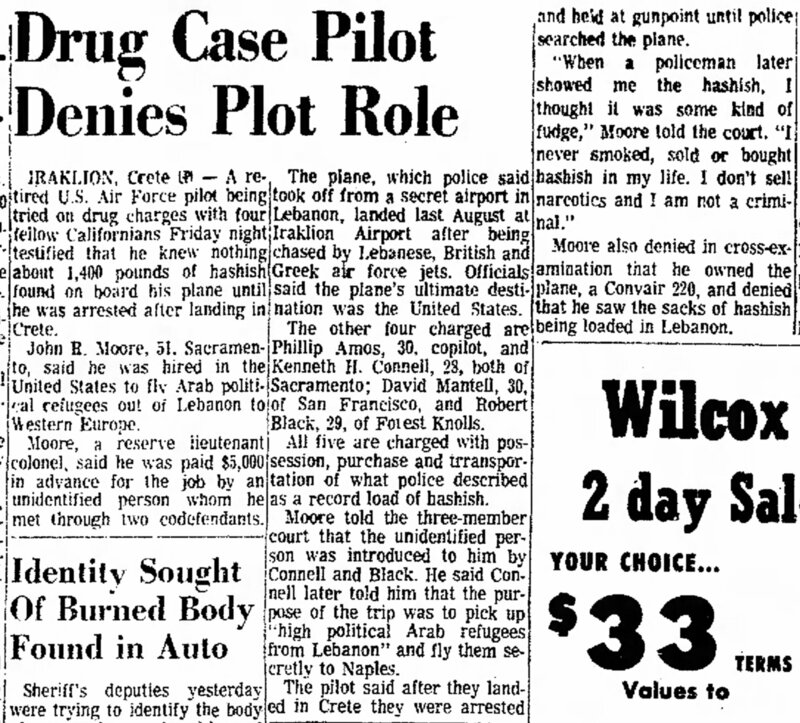 Moore also denied in cross-examination that he owned the plane, a Convair 220, and denied that he saw the sacks of hashish being loaded in Lebanon.